"Krsna consciousness is already there in the core of everyone's heart. But because of our materially conditioned life, we have forgotten it. The process of chanting the Hare Krsna maha-mantra -- Hare Krsna, Hare Krsna, Krsna Krsna, Hare Hare / Hare Rama, Hare Rama, Rama Rama, Hare Hare -- revives the Krsna consciousness we already have. 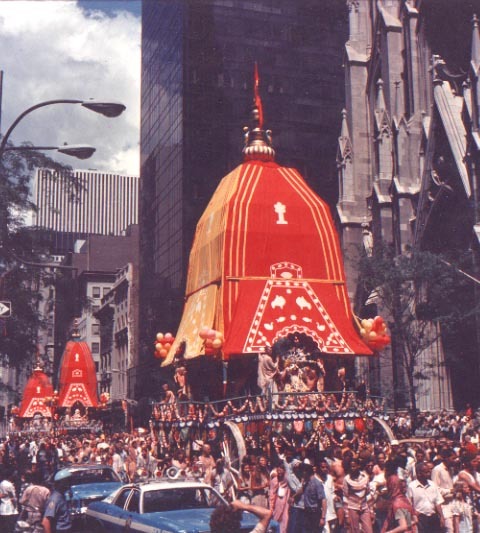 For example, a few months ago these American and European boys and girls did not know about Krsna, but just yesterday we saw how they were chanting Hare Krsna and dancing in ecstacy throughout the whole Ratha-yatra procession. Do you think that was artificial? No. Artificially, nobody can chant and dance for hours. They have actually awakened their Krsna consciousness by following a bona fide process."